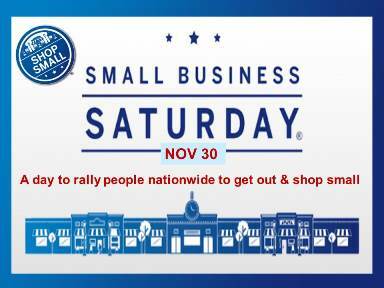 Small Business Saturday is coming up on November 30th and as an SMB owner, you will want a strategy in place now to stand out from the crowd. At independent, locally owned businesses 52% of what is spent stays right in that community. So share this fact with patrons because it matters to them and will bring them out in droves. This is the perfect time to gear-up for a great start for the holiday shopping push with these 10 ways to make your business boom on Small Business Saturday 2013! #1. Hook-up with your local chamber and get on their marketing bandwagon. Sponsor any events they run that day and get on any fliers, signage or other collateral they pass out to attract the attention of the local crowds. #2. Open early and offer goodies! Patrons are much more likely to walk into a small business if there are tempting samples waiting and while they’re there they are extremely likely to look around and shop so make sure your store is set up for success with eye-appealing displays and cheerful personnel. Additionally, learn the 6 psychological triggers that win sales and influence customers you can also put to use this weekend. #3. Promote the fact that this is sponsored by American Express and all AX card holders get a $10 credit when they register their card by using it to shop at independently owned businesses on Small Business Saturday. Also, take advantage of the free marketing materials from Small Business Saturday including online ads, printable signage, logos and imagery and suggested social media and email templates. Click here to access this Resource Center. Get on the Small Business Saturday map– sponsored by American Express. This way all your patrons know you’re participating and they can find you and your deals easier. #4. Make your store front stand out to passer “buyers.” Special signage, glass art, window displays, and decorative touches draw the attention of shoppers. Just by doing these simple items you engage with prospective customers and get them into the shopping spirit. #5. Launch your BEST holiday shopping offers on this day. This means your 50% offs, 2 for 1s, door busters, raffle giveaways, etc. need to be center stage today- showing your local patrons that you mean business. Be sure to get those out to your loyal client base via your email list right away, and remember don’t just tell them once tell them thrice. This excites the crowd and gets them to tell their friends and family as well. #6. Partner with other local businesses and exchange coupons for them to pass out to their customers for you and vice versa. Cross-promotional marketing efforts are a win-win and many local businesses would be happy to create deals and share promotions with customers. #7. Use the inspired ideas of other small businesses and how they drove results last year during Small Business Saturday. Watch the videos here. #8. Create awareness around your spectacular specials with great graphics and pictures of what you plan to offer on Small Business Saturday to your fans on Facebook, Twitter, Pinterest, and other social media outlets. Get creative. And get other stores near you to share your offers on their social media sites and do the same for them. Spreading the word and working together is KEY. #9. Consider how you can make it easier for visitors of your business to consume more of your products or services. A great answer is to cleverly package multiple items into one as a special offering. You get them involved in experiencing more of your products which creates loyalty and you move more products when they are in prime buying mode. #10. Amp yourself and your staff up. Think about running internal contests not only around sales but for providing great “holiday” inspired service as well. By doing this you raise the overall experience of shoppers, which means they’ll stay longer, shop more and tell their friends! This is the first weekend of the holiday shopping season and patrons are out in force, credit cards in hand, ready to roll. Make sure you are prepared with a solid marketing and promotional strategy to get record sales this Saturday!